Booze News: TRUE GRIT is the year's best! 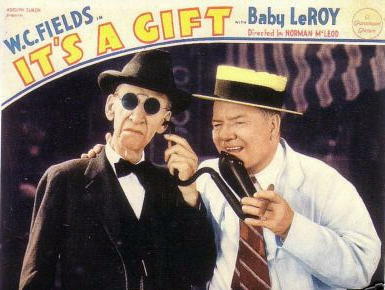 Let's lift an Orange Blossom (gin and orange juice) tonight in honor of the Great Man and his film, It's A Gift! The Coen Brothers' new take on Charles Portis' novel True Grit doesn't really qualify as a "booze movie," despite the fact that Reuben "Rooster" Cogburn is known as a man who "likes to pull a cork." 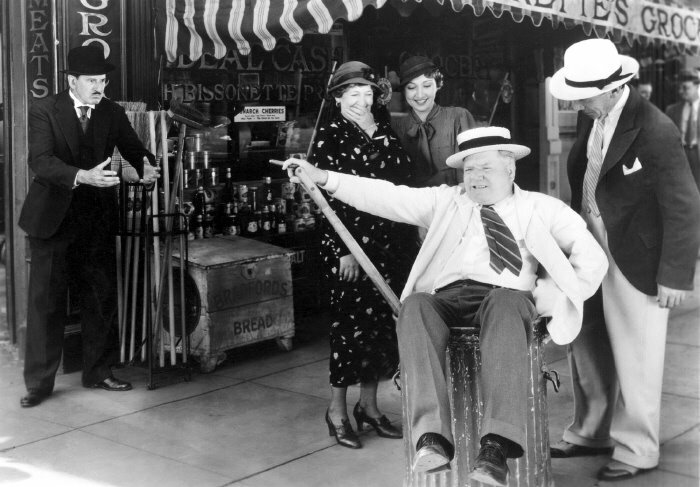 There simply isn't enough drinking in the movie (with the exception of one scene in which Rooster downs a considerable amount of confiscated whiskey). Still, I feel compelled to write a micro-review of the film, because True Grit is the best motion picture I've seen this year, and it's the best American Western since Unforgiven (1992). Actually, it's better than Unforgiven. Sorry, Clint. The Coens are simply better filmmakers. 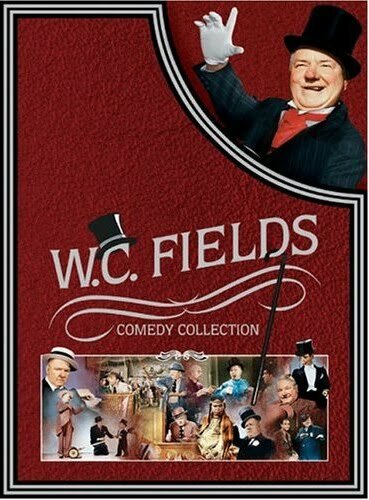 It should be no secret to anyone that has visited this site that I am a fan of old movies. However, I can say without reservation that the new True Grit surpasses the 1969 Henry Hathaway-directed version with John Wayne in every measurable criteria, including script, cinematography, direction, acting, mood, thrills, and entertainment value. The highest of all praise in this extremely praiseworthy film should be bestowed upon Hailee Steinfeld, who plays the central character, 14-year-old Mattie Ross. If she isn't nominated for the Best Actress Oscar, I'll be severely disappointed. I'd also say that Joel and Ethan Coen may have crafted their best film with True Grit. I can't call it my favorite Coen Brothers film after a single viewing (Miller's Crossing has held that crown for a long time). However, True Grit may nose it's way to the front of the pack eventually. It is a near-perfect film. Do yourself a favor and see this movie on the big screen while you have a chance. Better yet, see it twice. I know I'll have to see it at least one more time in its full theatrical glory. Somehow I missed a report a few days ago at Variety.com that the Weinstein Co. has made a deal with Miramax to produce sequels to many of their hottest library titles, including Shakespeare in Love, Rounders, and the greatest Christmas film ever made, Bad Santa. It is predicted that these projects will go in production next year. Future theatrical sequels or TV projects may also be developed based on Swingers, Bridget Jones' Diary, The Amityville Horror, Copland, From Dusk Till Dawn, Clerks, and Shall We Dance. 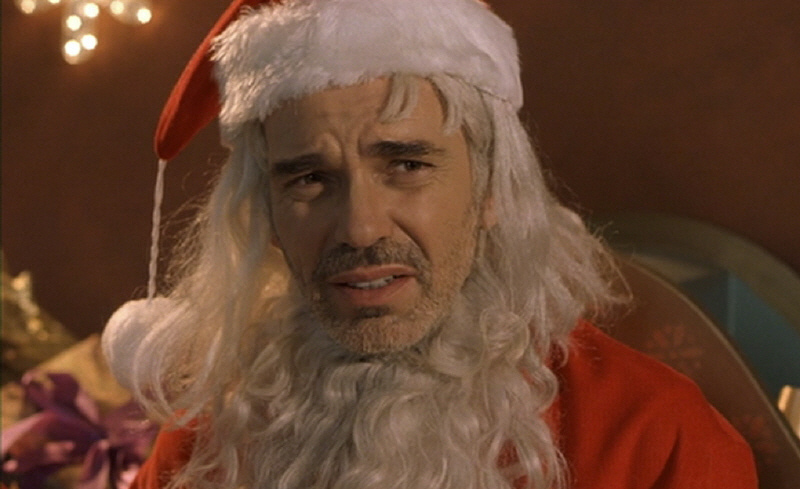 Since Billy Bob Thornton has expressed interest in the past in reprising the role of Willie T. Soke (especially if Terry Zwigoff can be lured back to direct), Bad Santa 2 is the most likely of the bunch to eventually reach a multiplex near you. That's a shame. Bad Santa is a perfect little gem, and a sequel can only end up sullying the name of the original. I've got five words (actually four words and a numeral) for anyone who doesn't think this is a bad idea--Arthur 2: On the Rocks. 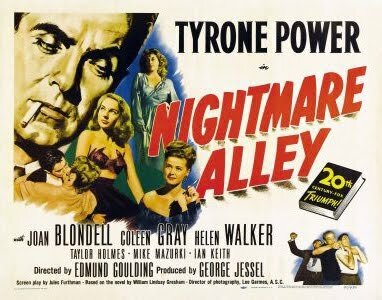 “How do ya get a guy to be a geek?” grifter Stanton “Stan” Carlisle (Tyrone Power) wonders at the beginning of 1947’s ultra-cynical film noir, Nightmare Alley. He’s just witnessed the carnival wild man eat live chickens, and he can’t fathom how a guy could get so low. The answer, of course, is booze. The geek is a bottle-a-day drunk who will do anything for his liquor. In posing the question, Stan doesn’t realize he’s just a misstep or two away from being a rum dumb sideshow attraction himself. Nightmare Alley provides the dark, voyeuristic pleasure of watching Stanton slide inexorably toward that fate. Like many noir protagonists, Stanton Carlisle is a “Class-A” heal. He begins as a barker at a small-time carnival, assisting Zeena (Joan Blondell), a middle-aged mind reader, and her whiskey-sodden partner, Pete (Ian Keith). Trying to worm his way into becoming a headliner in the act, Stanton decides to assist Pete in drinking himself to death. 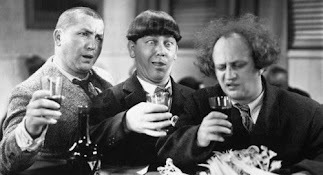 The plan works a little too well when Stanton accidentally gives Pete a bottle of wood alcohol instead of moonshine. When Pete dies of alcohol poisoning, Zeena teaches Stan the word code that is the key to the mentalist act. Soon after, Stan dumps Zeena and leaves the carnival with a younger beauty (Coleen Gray). Together they take the act to the nightclub circuit, where Stan finds big money and fame as “The Great Stanton.” After such a meteoric rise, a big descent is sure to follow, with only alcohol to cushion the fall. 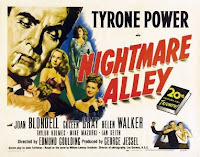 Fed up with playing nice-guy romantic leads and swashbuckling heroes, Tyrone Power purchased the rights to William Gresham's novel, Nightmare Alley, in order to convince the brass at 20th Century Fox to let him play the unsavory lead. 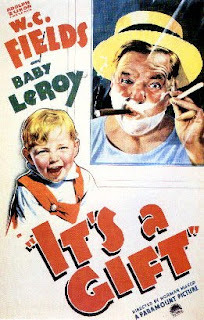 Although hesitant to let their biggest star sully his reputation, the studio bosses reluctantly relented. The resulting film and Power’s performance were both deliciously dark triumphs. The pretty-boy star would never be better than as “The Great Stanton,” and the pitch black film wouldn’t have worked nearly as well without such a magnetic star at its center. The supporting cast is also outstanding. Power is given fine support by his three leading ladies--Joan Blondell, Coleen Gray, and Helen Walker. Character actors Mike Mazurki, Taylor Holmes, and especially Ian Keith (in a scene-stealing turn as the drunkard, Pete) also add color to the proceedings. Potent Quotables--STAN: Well, you’re a fine one--running off in the middle of the show. Zeena was sore. PETE: I couldn’t help it. She’s got me on a diet--one shot a day. STAN: You seem to be doin’ all right. PETE: No. Just a sip here and there. Zeena’s tipped everybody off. Similarly Sauced Cinema--Booze darkened many noirs prior to Nightmare Alley, including the previous year’s Black Angel.